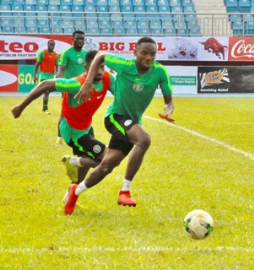 Assistant captain of the Dream Team VII Kelechi Nwakali has boldly declared that they are ready to overturn the 2-0 defeat suffered in the first leg of their 2020 Olympics qualifier against Libya when both sides clash at the Stephen Keshi Stadium Asaba on Monday. The Porto B midfielder who is loan from Arsenal spoke to allnigeriasoccer.com on their readiness for the win or bust clash. "First of all, let me say the game in Tunisia (versus Libya) we had only 45 minutes of training as a team, we had little time to train," Nwakali stated after the team's Sunday evening training. "We have trained and are ready now. They are a counter attacking side. It's not a do or die affair but we will work as a team to attain our objectives and the only objective is to get the goals that will take us to the next stage. ''We are taking this game seriously," the skipper of the Golden Eaglets side that won the 2015 FIFA U-17 World Cup in Chile concluded. Sunday evening's training was a closed door session.